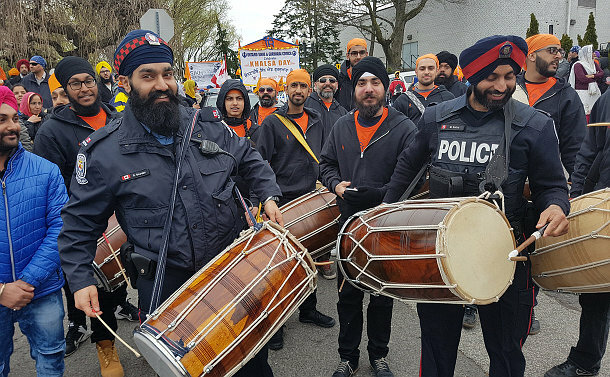 Officers joined the Sikh community in celebrating Khalsa Day with food, dance, music and a colourful parade to celebrate the birth of their faith. 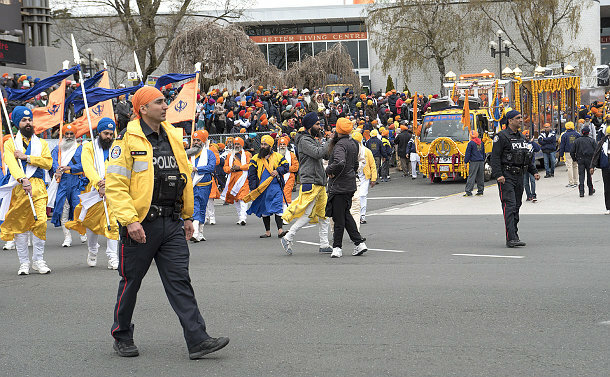 The Khalsa Day parade is held in celebration of the Sikh New Year and to mark the end of Sikh Heritage Month. 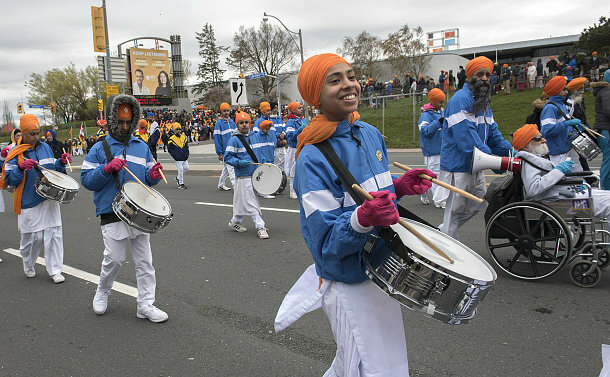 The event has grown from 2,000 people in 1986 to become the city’s third-largest parade, featuring colourful floats, martial arts performers and members of the community dressed in traditional saffron colours. The parade, which drew 40,000 Torontonians, began at Exhibition Place, with many colorful floats and five ‘beloved ones’ holding the Sikh and Canadian flags. Thousands of people lining the route were offered free food and drink – an act known as Langar, or free kitchen. The parade ended at Nathan Phillips Square with vibrant spirits in spite of cold weather. The Sikh community presented a plaque to Toronto Police officers for their contribution, support and dedication to the community. Inspector Richard Hegedus noted his great honour in receiving the award on behalf of Chief Mark Saunders and Toronto officers. “I know this event has been going on for decades and it’s wonderful to see families and extended families and people who have been coming here since they were children and now are bringing their own children to the parade. It’s a very special event for the Sikh community and we’re proud to take part,” said Hegedus, who had the opportunity to experience the tying of a turban himself – his head wrapped in traditional colours. Public Safety Unit Special Events Constable Michelle Flannery said the parade is always a great celebration. For the first time, the Ontario Sikhs and Gurdwara Council launched Sikhs for Sick Kids (sikhsforsickkids.com) fundraiser where all proceeds from the parade were donated to The Hospital for Sick Children.